Before Crafting Fashion became my blog about cutting and sewing sweater knit fabric, Crafting Fashion was a members only yarn-on-cones club. 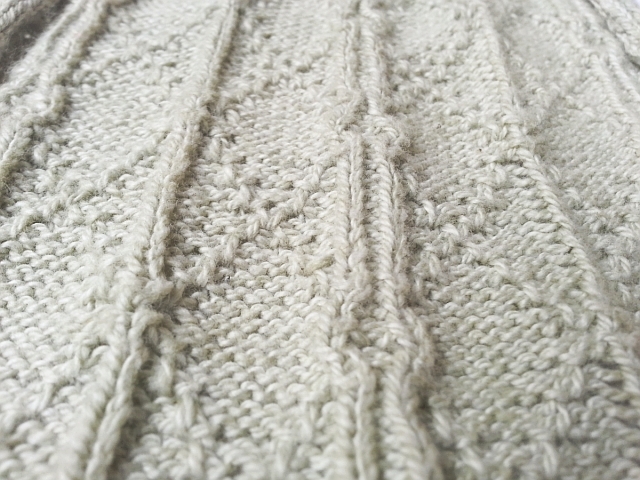 It was during this time, in January 2012 I wrote a post on Knitting in the Fastlane providing machine knitters with tips on machine knitting a product called mercerized cotton yarn. Machine knitters and hand knitters alike are sometimes challenged by any cotton yarn. Very often, cotton yarn isn't as stretchy as wool yarn and, unless you are used to it, just "doesn't feel right" on a hand knitting machine or when hand knitting with two (or more) needles. I admit that, at the time, I was attracted to the sheen, rich colors, and stitch definition of mercerized cotton, only vaguely understanding the harsh chemical process it went through to get to that mercerized state. By April 2014 after reading several articles, including this one by Tom Beaudet, I was seriously questioning my use of the product. I sought something else. I have often toyed with the idea of working exclusively with wool all year round. In fact, I hope to offer a nice lightweight, summer wool in the shop one day. But not yet. Instead I did more research on cotton yarn. I made a bunch of phone calls. I asked around. And I became interested and impressed with the cotton growing practices of the Sustainable Cotton Project. I found the cotton I wanted to knit! The current fabrics that I'm developing use non-mercerized, sustainable cotton yarns. The fabric after machine washing and drying is extremely soft. As I stated in my New Year's post, the new fabrics will be produced locally on industrial knitting machines. This means that O! Jolly! fabrics will be wider than was ever possible when knitted on my hand knitting machines. More yardage will be knitted, which means lower prices for the customer. If you're not receiving my newsletter [see sidebar], please join now! I'll soon be sending out coupon codes for limited time discounts on these future O! Jolly! fabrics. Pictured at the top of this post is an extreme close-up of one of these natural cotton knit fabrics. Machine washing and drying the fabric makes the yarn bloom and yields a material as plush as soft wool. I love it! And did you know that cotton grows in colors other than white? I'll also have available fabric knitted from color-grown cotton -- more about that fabric in a future post. Needless to say, I'm very excited! Neat! I can't wait to see what you come up with for the colored cotton.